27 “Yes, Lord,” she told him. “I have always trusted that you are the Messiah, the Son of God, the one who has come into the world from God.” 28 Then she returned to Mary. She called Mary aside from the mourners and told her, “The Teacher is here and wants to see you.” 29 So Mary immediately went to him. 30 Jesus had stayed outside the village, at the place where Martha met him. 31 When the people who were at the house consoling Mary saw her leave so hastily, they assumed she was going to Lazarus’s grave to weep. So they followed her there. I don’t know about you, but I am enjoying our slow walk through the Gospels. It gives us time to catch the small details and appreciate some of the depth and nuance the Scripture has for us. Three details stand out to me in today’s passage. First is the gentle way Jesus leads Martha to a deeper expression of faith in him. Yesterday we read a pretty bold statement of faith from Martha, perhaps even a suggestion that Jesus might raise her brother. 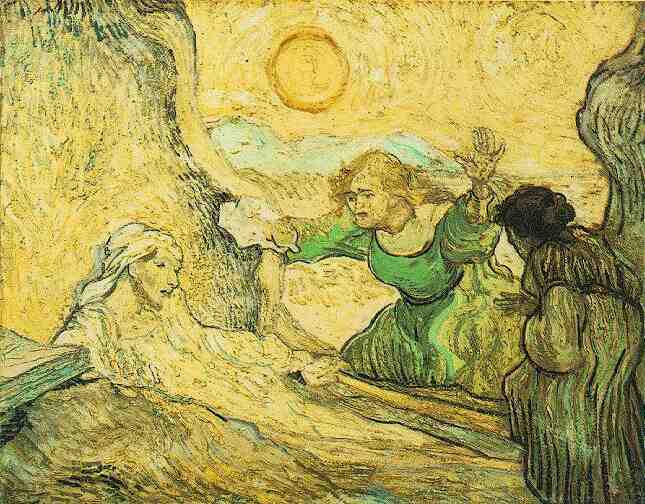 Here Jesus assures her Lazarus will rise again. If we remember the ongoing argument between the Sadducees and Pharisees over this issue, we can see that Martha has learned (either from the Pharisees or from Jesus) that a general resurrection will occur. Jesus leaves his first statement ambiguous (I think intentionally so), giving Martha an opportunity to think about that and affirm it. Then Jesus moves beyond what Martha already believed to what she had no idea about, that Jesus himself IS the resurrection, that death is not a fixed barrier at all for the Anointed One of God. Jesus reveals himself to Martha in this moment in a way and to a degree he had not done before. The closest he came was with the Samaritan woman at the well, but this is more revealing than that by quite a wide margin. Martha takes this new information in stride and openly, boldly confesses to Jesus that she does trust that he is Messiah, that she had done so from the start. Jesus gently gets her to state plainly and courageously what she had felt and kept to herself for so long. Jesus brings out the best in us, the trust in him we feel like we want to walk in but are afraid to speak. And do I need to elaborate on the significance that twice (and only twice) now in John, Jesus has revealed himself as Messiah – and both times he revealed himself to a woman? Jesus was no complementarian. Time and again in the Gospels, he showed preference for women, entrusting them with a lot more than he did his male followers. This continued in the early church and persists wherever followers of Jesus take the Bible seriously. I know some claim that subjugating women is biblical, but they are reading it wrong. They are free to do and teach as they like, but they don’t get to call it “biblical,” because it’s not. The second and third details go together. Notice the movement of people in this passage. Jesus comes to Bethany. Martha leaves their house and meets him on the outskirts of town (presumably closer to the grave). Mary stays behind. After her deepening of faith, Martha goes back and gets Mary, while Jesus stays there, waiting outside town. Then Mary comes and meets Jesus where Martha left him. Such small details, but John includes them and they seem a little off. Why didn’t Mary go with Martha to begin with? Why didn’t Jesus go back to the house with Martha? (I feel bad for Martha making all these trips.) We will read about Mary’s interaction with Jesus tomorrow, but for today, think about these details. I freely admit that what follows is conjecture, but I have thought about this passage for a long time, and while I can’t prove what I’m about to say, and while you’re free not to agree with me on this, I can at least say that I don’t see any harm or theological error in my theory (sometimes that’s the best we can do!). If we remember Luke 10, Mary and Martha showed different responses to Jesus on another occasion. Martha was very active, taking care of Jesus and the other guests, tending to the food, etc., while Mary sat at Jesus’ feet. Some take from that a metaphor for the difference between the active and contemplative life. But maybe it speaks as much to their different personalities (which may be saying the same thing another way). We see something similar here. Martha moves immediately and goes straight to Jesus. Mary remains behind, perhaps immobilized by her grief. It is common to lift Mary up as the good example from Luke 10 for attending to the one thing that mattered, and here maybe grief was the one thing that mattered. Except there was Jesus approaching town. So maybe Mary and Martha just give us two different responses to Jesus, neither better or worse, just different and if we would incorporate their examples into our own lives, sometimes contemplation is more needful and other times action is more needful. But that is all on the theoretical-metaphorical level. And I don’t usually hang out there too much. Here’s what I think was going on: I think Mary was angry with Jesus for not responding to the message they sent. She felt forgotten, overlooked, and incredulous that Jesus could have all this power to heal and not cure his dear friend and her beloved brother. I think she stayed at the house because she didn’t want to see Jesus at that moment. He was, ‘a day late and a dollar short,’ as the saying goes. And I think Jesus understood this (he has been reading thoughts and emotions all through John). When she wasn’t with Martha, he knew she wasn’t ready to see him, so he waited where he was until she was ready. With her newly deepened faith, Martha was able to persuade Mary to go to Jesus, who patiently waited for her. This is nearly opposite to what Jesus did in chapter 9, where he healed a blind man who hadn’t asked for it and didn’t know who Jesus was. If I’m on track here, this means sometimes Jesus ambushes us, sometimes he meets us as we’re running to him, and sometimes he waits patiently while we work through being angry with him. This is the sort of thing that can help us rethink how we narrate coming to Jesus. We saw this already when the blind man baptized himself before even coming to faith. Here we see two more very different paths to Jesus (or three more if we count Lazarus). It is easy to narrow in on one way, to generalize from our experience and make it normative for everyone else. But I hope we can see that Jesus isn’t interested in checking off boxes in some proper order. Jesus is interested in each of us and approaches us as best suits our personalities and situations.